WEDNESDAY MARCH 27 VS QUEENSBOROUGH: (Valhalla, NY) – The only thing more impressive than the fact that the Westchester Community College baseball team scored 10 runs during a single inning on Wednesday afternoon was that the 10-run first inning rally was not the most number of runs the Vikings have scored during a single inning this season. In fact, it was not even the second most. 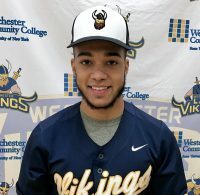 For the third time this season, Westchester CC reached double-digits during a single at-bat, this time all but putting away the game with their incredible bottom of the first inning en route to a 14-1 win over visiting Queensborough Community College on Wednesday afternoon at Vikings Field. With the win, Westchester is now 11-3. During an opening frame that took more than 35 minutes to complete, Westchester sent 14 players to the plate, two of which scored twice. The key blow was a bases loaded double by sophomore Steve Messerschmitt (Carmel, NY/Carmel HS) that scored Steve Guzman (Bronx, NY/John F. Kennedy HS) and CJ Spence (Mount Vernon, NY/Mount Vernon HS) to make it 2-0 in favor of Westchester, and set the tone for the rest of the inning. That would not be the last time WCC would hear from Messerschmitt. Later in the inning, up 6-0, a Tyler Parshley (Carmel, NY/Carmel HS) bases loaded double scored Sean Vanegas (Bronx, NY/Mount St. Michael) and Chris Cipriano (Irvington, NY/Dobbs Ferry HS) to make it 8-0. Next came Messerschmitt again, who singled home Guzman and Parshley for the 10-0 edge. Three innings later, up 10-1, a Jhojandy Hernandez (Bronx, NY/Salesian) RBI single made it 11-1, and then the Vikings scored three runs on Queensborough errors for the 14-1 final. Westchester previously scored 16 runs during the sixth inning of a 19-6 win over Kingsborough Community College on March 13, and 12 runs during the bottom of the fifth inning of a 17-3 win over Holyoke Community College on March 17. Messerschmitt had another big day as he went 2 for 3 with four RBI’s and a run scored, and is now hitting .390 with 19 RBI’s for the season after hitting only .237 with a total of 10 RBI’s during the 2018 campaign. Also for WCC, Guzman had three walks and scored three runs. Westchester scored the 14 runs on only seven hits, but benefited from eight walks, two Tiger errors, and two Viking batters hit by a pitch. Westchester CC sophomore Luis Gomez (Bronx, NY/St. Raymond’s) was outstanding on the mound, pitching four strong innings, allowing a single unearned run, while striking out five and walking only one to improve to 2-0 for the 2019 season. WEDNESDAY MARCH 28 VS SUSSEX Newton, NJ) – Freshman Jhojandy Hernandez (Bronx, NY/Salesian) connected for his first career home run, a three-run inside-the-park blast in the eighth inning. Fellow freshman Hector Camacho (Harrison, NY/Harrison HS) pitched seven stellar innings as the Westchester Community College Baseball team notched its fourth straight win with a 14-2 win over Sussex Community College on Thursday at Sussex. With the win, the Vikings improve to 12-3, outscoring opponents 47-15 during the current winning streak. Aside from Hernandez’s heroics, six different Vikings had two or more hits. There was also 3 for 5 day with two RBI’s and three runs scored for sophomore Sean Vanegas (Bronx, NY/Mount St. Michael), and two hits apiece for Hernandez, Chris Cipriano (Irvington, NY/Dobbs Ferry HS), CJ Spence (Mount Vernon, NY/Mount Vernon HS), Brian McBride (Putnam Valley, NY/Putnam Valley HS) and Hailyn Gonzalez (Bronx, NY/Bronx Envision Academy). Camacho earned his first career win for WCC, scattering six hits over seven innings, and allowing only one earned run. SATURDAY MARCH 30 VS UCONN AVERY POINT (Groton, CT) – Sophomore Dylan Sabia (Mahopac, NY/Iona Prep) pitched five splendid innings in relief, and Freshman Jhojandy Hernandez (Bronx, NY/Salesian) had another huge game. Hernandez went 2 for 3 with 3 RBI’s as the Westchester Community College Baseball team split a doubleheader with UConn-Avery Point, coming back to win the opener 9-8 before dropping the nightcap 14-1. After the split, Westchester is now 13-4. The opener had playoff like intensity between to teams that always seem to find each other during the post-season. UConn opened the game with two runs during the bottom of the first inning for the early lead, but a Hernandez double that scored Sean Vanegas (Bronx, NY/Mount St. Michael) and Chris Cipriano (Irvington, NY/Dobbs Ferry HS) to tie things. However, UCAP quickly scored three times in the bottom of the second inning to take a 5-2 lead. Enter Sabia. During more than four innings of relief, he allowed only three runs on three hits, striking out six, while throwing 93 pitches. He earned the win after giving the Vikings the opportunity to come back. The Vikings scored a run in the third and five more times during the fourth inning, the key blow being a Tyler Parshley (Carmel, NY/Carmel HS) two-run double to allow Westchester to take an 8-5 lead after four innings. The teams traded runs during the fifth inning, and then UConn scored twice in the sixth inning to make it 9-8, but would get no further. Sophomore Luis Gomez (Bronx, NY/St. Raymond’s pitched a perfect seventh inning to earn the save. Vanegas went 2 for 4 with two RBI’s and two runs scored. Freshman Brian McBride (Putnam Valley, NY/Putnam Valley HS went 3 for 3 with two runs scored. Also for WCC, freshman CJ Spence (Mount Vernon, NY/Mount Vernon HS) had two hits. The nightcap was a different story as Westchester had only three hits, and UCAP scored six runs in the second inning and seven runs during the fourth inning. The lone highlight for Westchester was a 2 for 3 day for Steve Messerschmitt (Carmel, NY/Carmel HS). Westchester Community College’s Sunday doubleheader against Monroe College JV canceled due to the poor weather forecast. SATURDAY MARCH 30 AT MT ST MARY’S (Newburgh, NY) – If their first-ever Track & Field competition as a varsity program is a sign of things to come for Westchester Community College, there are only big things coming for the Vikings. Facing a field of 14 schools that included 10 NCAA four-year programs, Westchester CC performed so admirably during their varsity debut that two Vikings qualified for the NJCAA National Championships in their respective events. Overall, the WCC men’s team finished in 10th place on Saturday at the Mount Saint Mary College Invitational in Newburgh, New York. Sophomore Alysha Owens (Mount Vernon, NY/Mount Vernon HS) wasted no time etching her name into the Westchester Community College record books, tying for first place in the Discuss Throw at 32.65 meters, easily surpassing the qualification point for the NJCAA National Championships. Amazingly, her incredible throw came during the final attempt of the day, an improvement of more than 4.5 meters. Owens also displayed a strong effort in the Javelin Throw and Shot Put. On the men’s side, freshman Malik Sainnoval (Brentwood, NY/Brentwood HS) also qualified for the National Championships in the Long Jump after a 6.42 meter effort that allowed him to finish in fourth place overall. Also for Westchester, freshman Andy Guillame (Newark, NY/Olympic Heights Community HS) earned a 16th place finish (out of 55 competitors) in the 200-meter dash with a 24.08 finish, while freshman Randy Culcay (Ossining, NY/Ossining HS) earned a top-10 finish in the 5000 meter race. Also, the WCC 4×100 meter team of Sainnoval, Kumnai McLean (Tarrytown, NY/Irvington HS), Muhammad Ahmed (Jefferson Valley, NY/Lakeland HS), and Nestor Ortiz (Irvington, NY/Irvington HS) earned an eighth place finish.